Unni Mukundan upcoming new Malayalam movies in 2013 are given in this article. 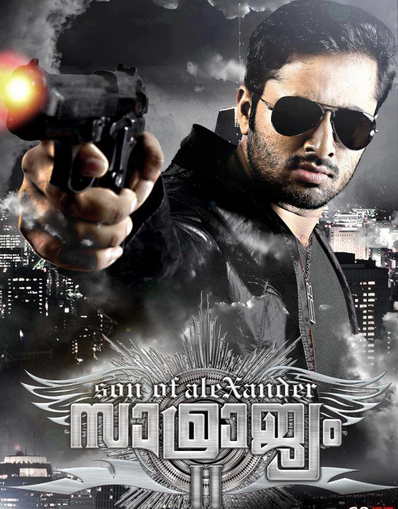 The new Malayalam releases of Unni Mukundan are 'Samrajyam II: Son of Alexander' and 'D Company'. Other projects like 'Kaattum Mazhayum', 'Vikramadityan', 'Iyer in Pakistan' and 'The Last Supper' is also lined in for the actor. Read the complete list of Unni Mukundan's new Malayalam movies along with related details. Unni Mukundan is another young actor Malayalam film industry received recently. He has become active in Malayalam and other south Indian language films. Now that many big budget films and opportunities are coming in search for this young actor, he is on his way to new stardoms. It is Unni Mukundan who dons the lead role in the sequel to one of the greatest hit movie in Malayalam, 'Samrajyam'. What more an actor can hope for in the starting of his film career. The actor has been already touted as the best action star happened recently in Malayalam. The upcoming new Malayalam movie releases of Unni Mukundan are two of the most anticipated action thrillers- 'Samrajyam II: Son of Alexander' and 'D Company'. Other upcoming Malayalam movies of Unni Mukundan in 2013 are 'Kaattum Mazhayum', 'Vikramadityan' and 'Last Supper'. Read more about these new films of Unni Mukundan below.
' Samrajyam II: Son of Alexander' is one of the most highly anticipated movies in the recent times. Sequel to Mammootty's yest-year blockbuster 'Samrajyam' and the big budget of the movie has made it in the news. The movie is going to crack all the records being the highest budget Malayalam film. Latest buzz is that the budget has already crossed more than 25 crore Indian Rupees. Unni Mukundan will appear as the son of Alexander in the movie. His name is Jordan. The story of 'Samrajyam II' starts where 'Samrajyam I' ends, which is the death of Jordan's father. Jordon also follows the path set by his father, being a gangster in the underworld. Jordan has to take up the charges of his father's empire at a small age of 13 after he loses his father. Jordan visits Kerala during one of his business trips, where the memories of his father come back to him. The eventful life of Jordan is being pictured in this movie. Ashi is the female lead; she will romance Unni Mukundan in the movie. This is the debut Malayalam film of the actress. Manoj K Jayan, Devan, Akanksha Puri and Vijaya Raghavan also come as other main characters in the movie. 'Samrajyam II:Son of Alexander' is directed and scripted by renowned Tamil director Perarasu. Ajmal Hassan and Baiju Adityan produce the film under the banner of Godson Atheena Films. The post production of this movie is going on and it will be released within few months. 'Samrajyam II' is not only confined to Malayalam film world, it will be dubbed into other languages after its release in Malayalam. Unni Mukundan dons the role of villain in one of the segment in the anthology film 'D Company' titled 'Gangs of Vadakkumnathan'. Directed by Dipan, 'Gangs of Vadakkumnathan' is an action thriller revolving around the some gangs located at Thrissur and the war between them. These gangs do whatever they want to complete the jobs assigned to them. Jayasurya is the head of one such gang. Religion also comes as a subject in the movie. Unni Mukundan's character in 'Gangs of Vadakkumnathan' is a newly recruited Police Officer. The shooting of 'Gangs of Vadakkumnathan' is now over and post-production works are going on. The movie will be released along with two other segments in 'D Company' next month. 'Kaattum Mazhayum' is a movie about organ transplantation starring Lal along with Unnimukundan. The movie is directed by award winning director Harikumar and the screenplay is penned by 'Annayum Rasoolum' fame Santhosh Aechikanam. 'Kaattum Mazhayum' is produced by Arun and Sudeep Karat under the banner of Sar Roza Marketing Solutions. Unni Mukundan comes as Jayanarayanan, a temple priest in the movie. Jayanarayanan has to do some odd jobs to arrange daily meals for his family. Jayanarayanan meets Hajiyar(played by Lal), a 70 year old man and related events changes has been grasped in the movie. Meera Nandan plays the lead heroine in the movie. Mamukoya and Praveena are also part of the main cast. 'Kaattum Mazhayum' is under post-production, will be released in the coming months. Unni Mukundan will share screen with Dulquer Salman for the first time with 'Vikramadityan'. 'Vikramadityan' is directed by none other than Lal-Jose and is being penned by Iqbal Kuttippuram. This is the first time both these young buds are getting a chance to act in a Lal Jose's film. The movie is touted as an action thriller where Unni Mukundan plays the role of a close friend of Dulquer Salman. The rest of the cast has to be finalized yet. Unni Mukundan's name is in news associated with some of the upcoming projects. He has replaced other young actors to don the lead roles in these films. 'Iyer in Pakistan' and 'The Last Supper' are the two other projects Unni Mukundan will be doing next. 'The Last Supper' is directed by debutante Nikhil. Nikhil has written the script of the movie too. The shooting of 'The Last Supper' starts soon. It was Nivin Pauly signed in for this role initially, but later Unni Mukundan gets the chance. George Sebastian is the producer of this movie under the banner of Play House Release. The other movie 'Iyer in Pakistan' is a comedy entertainer, directed by another debutante Fazil. The movie is produced by M Mani under the banner of Aroma Productions. The offer to become Iyer came to Unni Mukundan after Fahad Fazil opted out of the project. Jagathy's daughter Sreelakshmi and Sanusha are the heroines in the movie. Unni Mukundan has wide future ahead with lot of promising movies in his kitty. The actor is blessed to work with some of the best directors in Malayalam. Most of his projects are high budget and fans are eagerly waiting for them. 2013 is going to be a remarkable year in his film career with Samrajyam II and D Company is making its release this year. He will be also seen in other small budget family entertainers too. The actor's easy availability has given him many opportunities replacing some other prominent young actors in Malayalam. Meanwhile the actor also enjoys a huge market at other language films too. Unni Mukundan is on his way to new heights in films, especially in Malayalam.